Your will must be witnessed in the special manner provided by law for wills. No will becomes final until the death of the testator, and it may be changed or added to by the testator by drawing a new will or by a "codicil," which is simply an addition or amendment executed with the same formalities of a will. A will's terms cannot be changed by writing something in or crossing something out after the will is executed. In fact, writing on the will after its execution may invalidate part of the will or all of it. Florida law regarding Wills can be found in Chapter 732 of the Florida Statutes. If you die without a will (this is called dying "interstate"), your property will be distributed to your heirs according to a formula fixed by law. Your property does not go to the state of Florida unless there are absolutely no heirs at law, which is very unlikely. In other words, if you fail to make a will, the inheritance statute determines who gets your property. The inheritance statute contains a rigid formula and makes no exception for those in unusual need. any property owned jointly with another person or persons with rights of survivorship (a tenancy by the entireties, which is limited to joint ownership between a husband and wife, would be one of these). A person may not disinherit his or her spouse without a properly executed marital agreement. The law gives a surviving spouse a choice to take either his or her share under the will or a portion of the decedent's property determined under Florida's "elective share" statute. This statute uses a formula to compute the size of the surviving spouse's elective share, which includes amounts stemming from the decedent's jointly held and trust property, life insurance, and other non-probate assets. Because this formula is very complicated, it is usually necessary to refer this matter to an attorney with extensive experience in this area of law. Also, if your will was made before the marriage and the will does not either provide for the spouse or show your intention not to provide for him or her, then your spouse would receive the same share of your estate as if you had died without a will (at least one-half of your estate) unless provision for the spouse was made or waived in a marital agreement. It is "good" until it is changed or revoked in the manner required by law. Your will may be changed as often as you desire while you are sane and not under undue influence, duress, or fraud, provided it is changed in the required manner. Changes in circumstances after the execution of the will, such as tax law amendments, deaths, marriage, divorce, birth of children, or even a substantial change in the nature or amount of your estate, may raise questions as to the adequacy of your will. All changes require a careful analysis and reconsideration of all the provisions of your will and may make it advisable to change the will to conform to the new situation. No, in most situations. A trust may be used in addition to a will. This is because a trust can handle only the property that has been put into it. Any property of a person that is not placed in the trust either during life or at death in most instances escapes the control of the trust. It is the will that controls all property in a decedent's name at the time of death if the will is drafted properly. Trusts can be helpful to speed administration and save taxes if they are drafted properly and funded during life with the property intended to be transferred by the trust. Often, however, improperly drafted or incorrectly funded or administered trusts can add to the cost of settling estates, not lower it. Furthermore, it is the probate of the will that can clear creditors' claims, which is not possible with just a trust administration. A well-drawn will can reduce estate and income taxes that may arise when someone dies. Estate taxes are often by far the largest cash expense an estate can have. Although the estate tax is currently scheduled to decrease gradually and then be repealed in the coming years, it still can be a major expense of a decedent's estate in the interim. There is also the possibility that congress may increase the impact of the estate tax in the future. In addition, proper planning must be made for income tax advantages. Proper planning with a will is indispensable in taking these benefits in the tax codes. Marriage does not cancel a will in Florida, but a spouse acquired after the execution of a will may receive the same portion of your estate that he or she would have received had you died without a will (at least one-half). Before your will is effective to dispose of your property, it must be proved in the probate court. If the will is self-proving and otherwise valid, it may be admitted to probate without further proof. If the will is not self-proving, it generally must be proved by the oath of one of the witnesses. The oath must be given before a circuit judge, clerk of court, or a commissioner specially appointed by the court for that purpose. (under certain circumstances, the court may permit the will to be proved by other means permitted by law.) A will can be made self-proving either at the time of its execution or later, which saves the time and expense of locating a witness and obtaining his or her oath after your death. For your will to be made self-proving, you must acknowledge the will before an officer authorized to administer oaths; the witnesses must make affidavits before the officer; and the officer must evidence the acknowledgment and affidavits by a certificate attached to or following the will. An appropriate form of certificate is prescribed by Florida law. The self-proving procedure is in addition to the normal execution and witnessing of the will, not in place of it. No matter how perfect a will may be prepared for you, unless it is properly executed in strict compliance with the laws of Florida, the will may be entirely void. Be sure that you execute your will in the presence of your attorney, who knows exactly how and in what order the will should be signed. Every person owning property who wishes to exercise control in the disposition of that property when he or she dies, should have a will regardless of the value of the property. Of course, the larger the estate the greater the tax consequences. living will - Florida statutes now provide for a written declaration by an individual specifying directions as to use of life-prolonging procedures. durable power of attorney - this document can assist in handling the property of a person who has become incapacitated without having to open a guardianship proceeding in court. This is especially valuable for paying the bills and protecting the assets of an incapacitated person. health care surrogate - Florida law now allows individuals to designate a person to make health care decisions for them when the individual may not be able to do so. Included in this important appointment is the power to decide when to withdraw medical procedures. 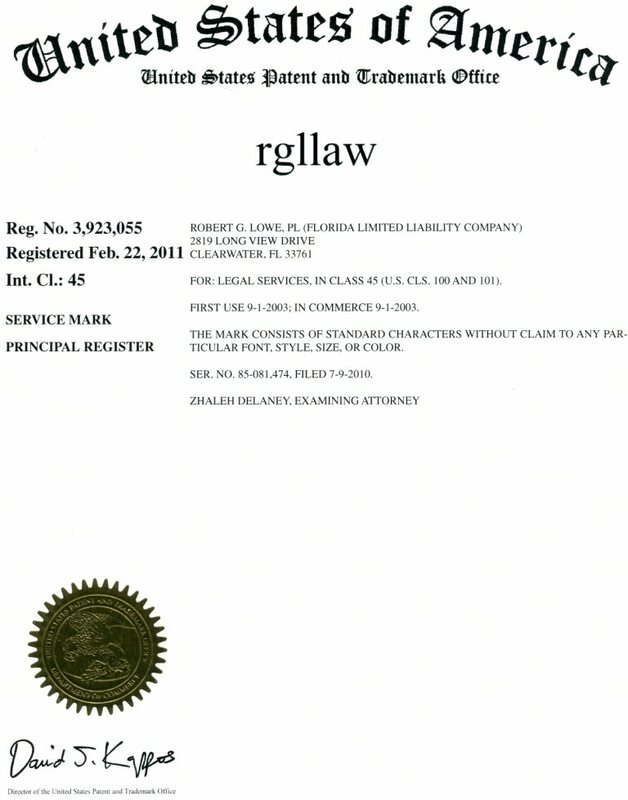 This information has been prepared by the Consumer Protection Law Committee of The Florida Bar and the Bar's Public Information Office and is offered as a courtesy by rgllaw®. Copyright, The Florida Bar February 2004. The material on this web site represents general legal advice. Since the law is continually changing, some provisions may be out of date. It is always best to consult an attorney about your legal rights and responsibilities regarding your particular case. If you believe you need legal advice, call your attorney. If you do not have an attorney, please contact Bob by e-mail or by phone at 727-647-3700. Or call The Florida Bar Lawyer Referral Service at 1-800-342-8011, or the local lawyer referral service or legal aid office listed in the yellow pages of your telephone book.